Volti is celebrating an anniversary. Ahoy! Just added a very special perk to our 40x40 campaign! Book your spot on a bay cruise during the Blue Angels' 2019 Fleet Week air show. The cruise will depart at noon on Saturday, October 12, and return by 5:00pm. Heavy hors d'oeuvres and beverages will be served. The vessel? The New Fandango. Your captain? Maestro Bob Geary, founding Artistic Director of Volti 🤩😎🥳 igg.me/at/volti 17 hours 35 min ago. Throwback... Tuesday? Six years ago this week, we were performing David Lang's "Battle Hymns" with San Francisco Choral Society, Piedmont East Bay Children's Choir and Leah Stein Dance Company at Kezar Pavilion. 20 hours 41 min ago. Volti is with Celeste Winant and 2 others. You can always count on dignity and decorum at a Volti event. Have you bought your tickets for the 40th Gala on May 4? https://www.brownpapertickets.com/event/3924850 1 day 17 hours ago. Volti shared a post. Our new CD comes out on Friday - it's already received a great review! Thank you, Don Kaplan and San Francisco Classical Voice! 1 day 19 hours ago. Volti updated their cover photo. Indiegogo for our 40th anniversary: http://igg.me/at/volti 6 days 16 hours ago. Volti, San Francisco's 20-voice professional chamber choir, has achieved national recognition as pioneers in new vocal music: they are the first and only chorus to have won ASCAP/Chorus America's Adventurous Programming of Contemporary Music Award six times. 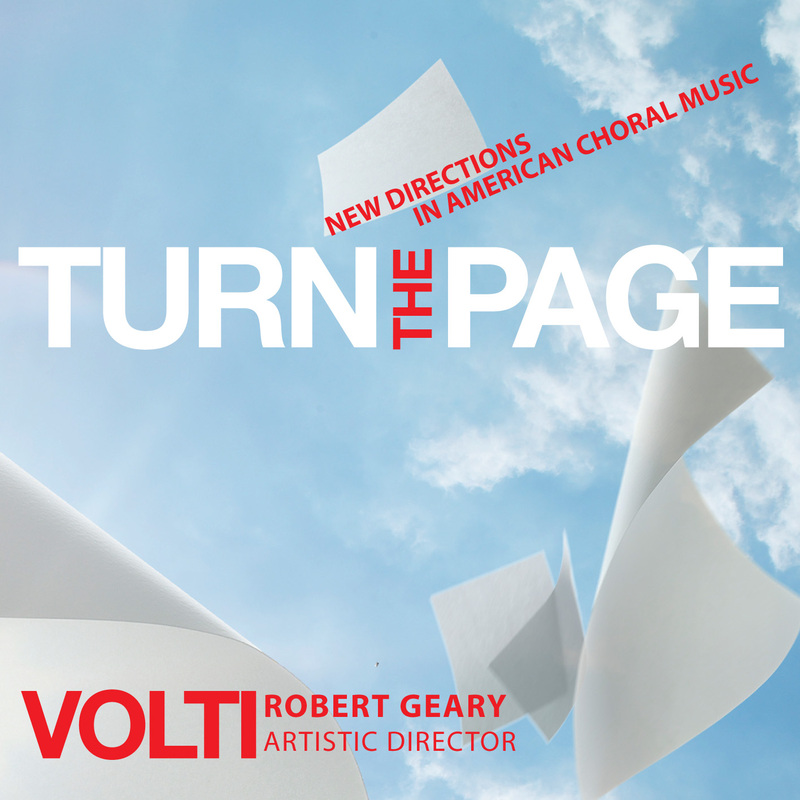 This disc shows what the buzz is all about, with works by eight contemporary American composers, five of them commissioned and premiered by Volti, under its founder and artistic director Robert Geary. Opening the disc is the first recording of all four movements of Aaron Jay Kernis' stunning and hypnotic Ecstatic Meditations, named by the National Endowment for the Arts as an American Masterpiece of Choral Music. Also featured is the first recording of a major new work by Volti's resident composer Mark Winges, Open the Book of What Happened (2005). Other never-before-recorded Volti commissions include Kurt Rohde's Endless, a six-part setting of luminous, elliptical poetry by Jakob Stein (2007); Gabriela Lena Frank's startling, rhythmic Ccollanan Maria!, a multicultural mix of traditional Catholic imagery with ancient Incan ritual (2004); two of Stacy Garrop's Sonnets of Beauty and Music, part of her project to set 23 sonnets of Edna St. Vincent Millay (2006); and Eric Moe's O the Flesh is Hot but the Heart is Cold (2005) - about which all we can say is that any piece of music based on a poem titled "Baked Alaska: a Theory of" just begs to be tasted. Rounding out the generous collection of over 75 minutes of music are Ronald Caltabiano's Metaphor (1994) (settings of three short poems - one each by Blake, Donne and Whitman - in playful comparisons of the behavior of insects to that of humans) and the "ancient," by Volti's standards, Two Motets of William Hawley (written way back in 1981, but too gorgeous not to be included here). The singers are superb, and director Robert Geary manages to find his way to the warm heart of even the most challenging modern score. Volti may well be the finest collection of chamber singers in the country... they're miraculous. The virtues of Volti, the excellent San Francisco chorus led by longtime Music Director Robert Geary, are well known to Bay Area audiences. This first-rate compilation of eight new choral works - many of them by local composers - should spread the news far and wide. The performances here are buoyant and transparent enough to let the texts and contrapuntal workings of the music shine through, yet they boast a weighty charge that speaks of serious attention to the task at hand. And the music itself offers an exhilarating range of artistic voices, from the rapturous beauties of Aaron Jay Kernis' "Ecstatic Meditations" to the canny literary pictorialism of Ronald Caltabiano's "Metaphor" to the well-mannered harmonies of Stacy Garrop's Edna St. Vincent Millay settings in "Sonnets of Beauty and Music." Nothing here could be construed as easy listening, but Geary and his forces invite a listener in with an irresistible blend of vigor and bonhomie. "[A]n exceptional collection of new American choral music … Volti under Robert Geary performs impeccably, and all the pieces are well crafted, stimulating, aspiring to different types of beauty. Volti’s approach is bracing … Aaron Kernis’s four Meditations are genuinely ecstatic, as their title implies. Setting poems by the Medieval mystic nun Mechthild of Magdeburg, they feel like a small choral symphony. They also explore how vocal writing can have a spirit of dance (most literally in the third movement). And Eric Moe’s O the Flesh Is Hot but the Heart Is Cold is a truly original work. Seeded throughout its flow is a series of catchy pseudo-folk/pop tunes that stick in memory. It has an uncanny combination of the banal and horrific. Once again, a great demonstration of effective, satisfying choral music that doesn’t insult your intelligence. Bravo."